Well, I went into this game with minimal expectations. Saints have nothing left to play for, other than remaining in the top half of the table, though getting into 8th place would be nice. Romeu returned to Saints starting lineup, but there was a surprise in Boufal replacing Redmond. From the kick-off Saints went at Chelsea, rather than sit back, as they did to Manchester City at the last home game. Cédric got a great cross in and Gabbiadini caused momentary panic in the Chelsea defence, but it came to nothing. On four minutes boufal showed the good side of his game, with some blistering pace on the ball, which drew a foul from PFA Player of the Year Kanté. The ref blew for a free kick in a dangerous position. JWP looked as though he was going to take the kick, but Tadić took it and almost placed it on the onrushing and unmarked Stephens head, but it was just in front of him and he ended up side footing it into the arms of the grateful Courtois. A well worked move straight from the training ground. Looking good. That didn't last long though. Chelsea worked it forward, a great ball was played forward and Costa, being marshalled by Yoshida, played the ball back to the onrushing Hazard, who volleyed it. Goal. Watching the replay was even worse. All the Saints players were watching Costa, the only player watching Hazard was Costa. Lack of concentration. After the goal, Saints played some lovely football and gave at least as good as they got. Hazard had one half chance, which he managed to put high and wide. Saints then had a period of sustained pressure and you just felt something was coming. 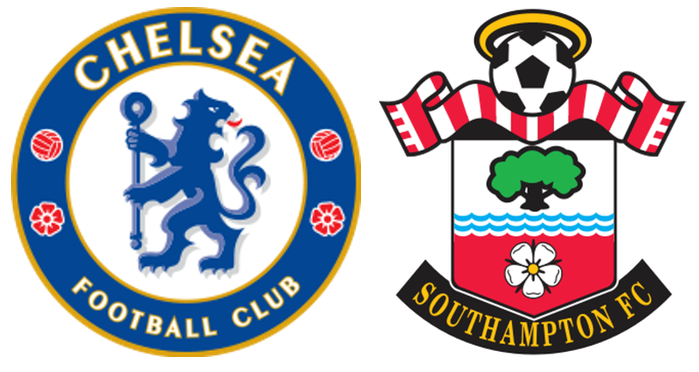 Saints won a corner on the left and it was taken by JWP and the ball found it's way through a crowd of players to the far edge of the penalty area to Gabbiadini who cut it back, just in time for the onrushing Romeu to tap it into the back of the net from no more than three yards out. Simple. Except when you looked at the replay Gabbiadini was shooting at goal and would have scored, but for an excellent stop by the outstretched boot of Courtois. He only succeeded in pushing it right into the path of the onrushing Romeu. Thanks very much. 1-1. The game then settled into end to end play. Either side could have scored with just a little bit of luck. There was one period where Chelsea had Saints on the rack, but it came to nothing. You began to get a real sense that Saints could get something out of this game, provided they could get to half time without conceeding again. There was a sustained period of Chelsea pressure leading up to half time and they won a corner, which had to be retaken, after some wrestling in the area between Bertrand and Costa, which saw the former end up on the ground. The retaken corner was headed out by Stephens and the ball fell to Kanté, some thirty yards out. He fired a ball to Alonso standing on the edge of the penalty area, who sent it across the penalty area to Cahill who powered a header past Forster. 2-1. It was in time added on. A huge psychological blow for Saints. The second half started in a strangely low key way. Fabregas getting booked for a late tackle on Romeu seemed to be the only excitement. The crowd had gone quiet and then Chelsea won a corner on the right in the 53rd minute. Hazard took it short to Fabregas, who lofted the ball into the penalty area and there was Costa rising above Bertrand to plant the ball past Forster. 3-1. And this after Saints had been playing well. The Chelsea crowd had their tails up now and were making a lot of noise. Saints were still playing well, but simply couldn't make the breakthrough. For all of the scoreline, there really was not that much difference between the teams, except one stat - by the 60th minute Chelsea had three shots on target and had scored three goals. Saints also had three shots on target, but had just scored the once. In the 68th minute Boufal gave way to Redmond. A straightforward like-for-like swap. Boufal had run himself into the ground, as he continued his acclimatisation to the Premier League. I think that I have seen enough of him now to know that next season he will be a very important player for us. Meanwhile Saints continued to make chances, but the ball just wouldn't fall kindly for them. Gabbiadini, Tadić and Romeu all were there, or thereabouts, all playing well, making chances, just not scoring. On 80', after a period of intense pressure, Chelsea broke away and Forster made a great stop from Kanté, pushing it behind for a corner, which came to nothing. At this point Puel clearly decided that caution was not the way to get anything from this game and replaced Ward-Prowse with Long and a few minutes later replaced Gabbiadini with Jay Rodriguez. The only result of this was, without JWP, Saints lost the midfield and the inevitable happened. Just on 89' after pinging the ball about Chelsea found Costa and he made no mistake, giving Forster absolutely no chance. I hate to say it, but it was a good goal. 4-1 and we really didn't deserve that. It wasn't quite over though, Ryan Bertrand scored a really good header deep into time added on. So, both the ex-Chelsea players scored on their return to Stamford Bridge. The difference between the two sides for me was just one man - Diego Costa. He gave Chelsea a razor-sharp cutting edge, making one goal and scoring two. Saints played well, but that just wasn't enough today.